I bought a new ship this week. After flying a Diamondback Explorer for the past couple of months, I realised that with the Horizons update, with lack of internal compartments, I would be struggling to properly equip the ship for a long exploration trip and allow me to take my Scarab vehicle with me. 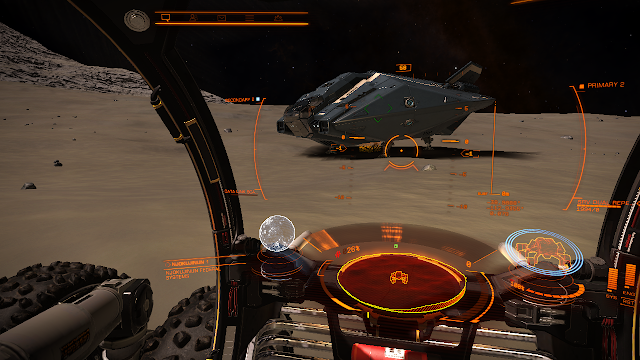 So I have an Asp equipped with Detail Scanner, Advanced Scanner, Auto Repair Unite, Vehicle hanger, A5 FSD. Buy back value is 12 million credits. A view from the Scarab. I have flown "up" from the galactic plane and it is my goal to find my first undiscovered star system. I want to get my name on a star or planet. Found a system with a space station with repair and outfitting facility right on the age of populated space. You know you are pretty far out when the station traffic record shows that your ship is the only one that has visited in 24 hours! Hope to document anything interesting I find along the way.